Heh, a mother-in-law joke! We would have NEVER thought of one of those. THOSE WHO FLASK LOUDEST: From magnets to notepads to tote bags, these retro magazine mashups have never once disappointed us. And now we're thrilled to have discovered corresponding flasks -- flasks! Why did we not demand these sooner? -- with messages like "Just let my conscience be our guide," "Why do dishes when you can do daiquiris?" 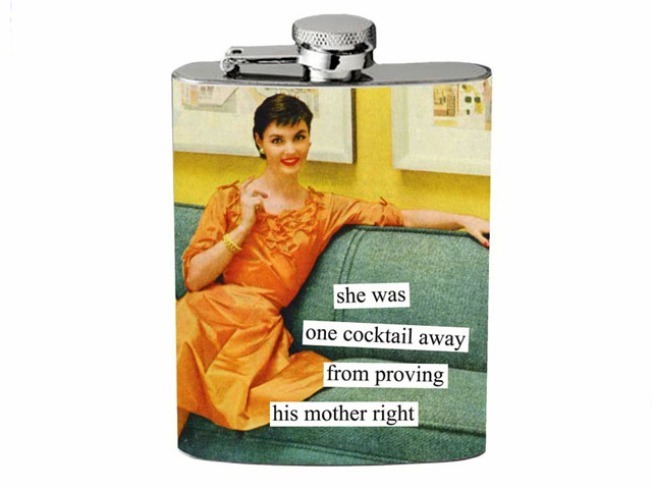 and our current fave (we think we've seen this one on an apron before), "She was one cocktail away from proving his mother right." The stainless steel flasks ($21 each) hold four ounces of your favorite, um, beverage. We're sure it's something healthy like carrot juice, of course. ALL KEYED UP: We may have a reason to put the Wii remote down for a couple minutes. (Only a couple minutes, though -- we just want to make that clear.) The Nintendo DS will be hitting a few right notes in November with the release of a new game, Easy Piano, which comes with an eight-note (full-octave) keyboard that attaches to the console. The game guides newbies with lessons and mini-games; experienced players can play 40 songs, ranging from Mozart compositions to "Bohemian Rhapsody." You'll also be able to compose and record up to four three-minute songs of your own. No price has been announced yet, but when you're lined up outside of Best Buy at 4 a.m. on Black Friday, keep this little gizmo in mind. RING THING: We'd propose marriage to ourselves if it meant we could use the Kate Spade tuileries ring ($95), a gorge bitty bauble with 12-karat gold plated hardware. Take your pick of clustered blue, pink, and cream pearls that jingle just the right amount to keep a spring in our steps all workday long.